Gobal deforestation -- or the removal of trees, shrubs and other plants from forests -- has increased markedly over the centuries. 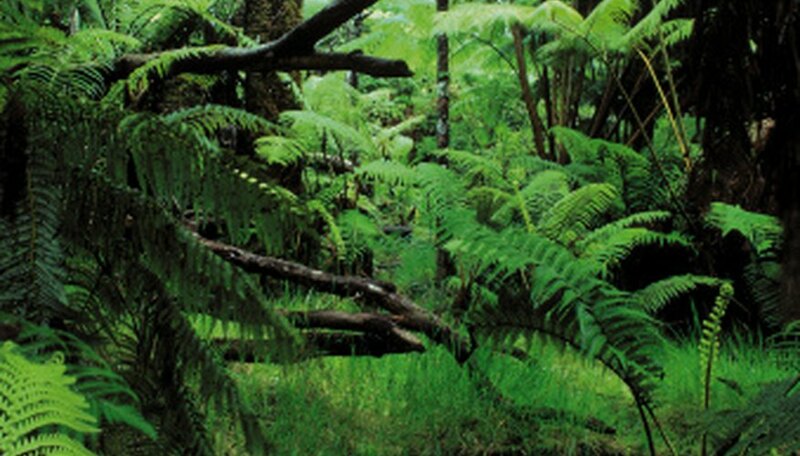 Forests, which once occupied half of the Earth's landmass, now cover less than one-tenth. Each year 130,000 square kilometers of the world's forests are destroyed, according to the United Nation's Food and Agricultural Organization. One of the devastating effects of deforestation is mudslides, which in the United States alone cause 25 to 60 deaths a year. Mudslides, which are wet landslides, usually occur on steep slopes stripped of vegetation when heavy rains, earthquakes or volcanoes destabilize them. Debris, rocks and earth flow or rush down the slopes, sometimes at high speeds and gathering a wet mass rising as high as 30 feet. Mudslides can completely bury buildings of cover villages. In 1999, mudslides killed 20,000 people in Venezuela when torrential rain pounded deforested slopes. With the absence of trees, shrubs and other vegetation, roots, which form a barrier against mudslides by holding back rocks and debris, are gone. Vegetation also slows the force and speed of mudslides. Deforestation is caused mainly by logging -- both legal and illegal; clearing for agriculture, mining, and the outward sprawl of towns and cities. In 2006, in just two minutes, a mudslide completely covered Guinsaugon, a village in the Philippines, and killed 57 people. In Port-au-Prince, Haiti, months before the disastrous 2010 earthquake, torrential rains triggered a mudslide which destroyed a hillside home and killed a family of four. In 1999, in Central America, numerous deaths occurred when Hurricane Mitch set off mudslides and flooding. In all instances, deforestation was a major cause of the mudslides. Around the world, attempts are being made to slow deforestation. President Gloria Arroyo of the Philippines -- where only 13 percent of former forests exist -- instituted a crackdown on illegal logging. Brazil is slowing the deforestation of the Amazon, the world's largest remaining tropical rainforest. Worldwide climate meetings focus on reducing deforestation and the increased greenhouse gases caused by this denuding. To allow people time to evacuate before mudslides occur, other countries are developing early warning systems. What Are the Characteristics of Floods? Kramer, Nina. "The Effects of Deforestation on Mudslides." Sciencing, https://sciencing.com/info-8408058-effects-deforestation-mudslides.html. 09 January 2018.